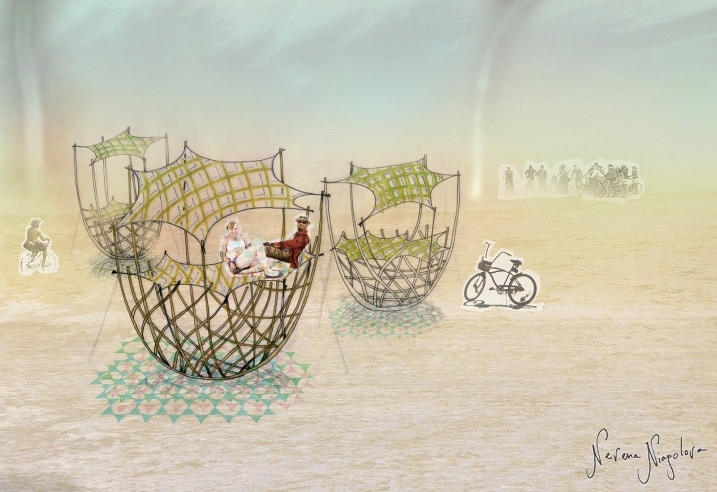 Burning Man Arts Black Rock City Proposal. The project resembles big rocking baskets with colorful beds where people can rock and roll in like floating in the sea. It wobbles when the dust devil visits and is bouncy to lay on. The bed casts kaleidoscopic shadows from the desert sun providing both visual spectacle and shelter to chill. The rocking baskets are little colorful oasis for the festival-goers to wind down, relax and connect with one another. It’s a sanctuary on a festive land, yet excitement remains and transcends to a different level of sensation. The wobbling, like gentle waves, swirl and pull people together and then separate them. The kaleidoscopic colours envelop the baskets. They swirl, and twist and turn sharing the energy with people. Their sedated or excited movements are in thus fueling a colorful play of visual and kinetic stimulation. Also aided by the wind and dust of it’s surroundings individual layers of the net come together, then separate and the colourful story continues. There is an expression of lightness, fluidity, drifting through time, change, but still within the bounds of safety and relaxation. We hope the unexpected connection induces people’s muse and fuse. The basket is weaved with wooden material such as bamboo and straw and strengthened with braid technology. It is roughly a hemisphere and hollow inside. It wobbles when engaged by the breeze and then returns to its upright orientation like a roly-poly toy. People can climb in and out through the structure. A colorful, reflective and transparent net is knitted just about shoulder height inside the basket to form a tensioned surface which both hold the structure together and function as a bed where people can climb on and lay down. Another net can be knitted at a higher level acted as a canopy. 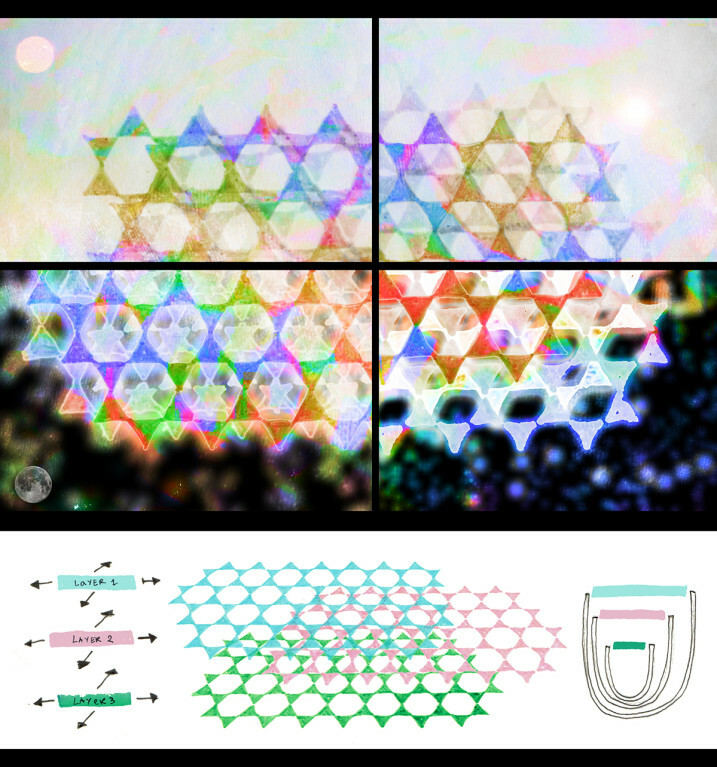 The net are layers of hexagrams overlapping one another. When people move around on the net, each layer stretches at different directions and casts continually changing colorful shadows to the people below creating a kaleidoscopic effect. The bounciness of the net makes every move interacts with the adjacent person. At night, the net glows in the dark casting light shadow of movement in the darkness. When it wobbles, it is like a buoy in the sea. This installation is about sharing. It’s the sharing of a space, of a rest. Sharing the feeling of another’s energy. The feeling of their minute or other movements, of their weight. It is a connecting surface that makes the distance between separated others more interesting and exciting; it makes it fluid and ever changing. It is participatory whit it’s movement and also when colour is involved. It is inclusive, fun. It is in tune with it’s surroundings and responds to their whiffs. One could be as expressive as they want, they could be calm, loud and amusing.